Previous castings of Great Dunstan. The 1499 Ring of Five. Bells transferred to the Oxford Tower in 1433. 1098 Prior Ernulf puts a bell in the Campanile, later adding 4 smaller ones. 1288 Prior Henry hangs original "Bell Harry" in North West Tower. 1316 Prior Henry placed 3 bells in Angel Steeple & "Thomas" in Campanile. Shortly after, 3 more bells were added to the Angel Steeple. 1382 Campanile damaged in earthquake. 1408 Chillenden/Arundel replace the bells in the Angel Steeple with a heavier five. 1409 Angel Steeple bells dedicated. 1433 Angel Steeple bells removed to North West Tower, replacing the existing bells which were themselves moved to the Oxford Tower. 1490 Smallest Arundel bell recast. 1499 John Bayle casts "le Mariebelle" and 5 other bells and recasts Great Dunstan. 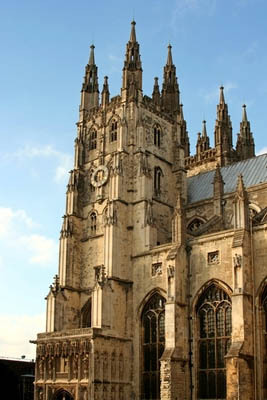 1500 Bell Harry Tower completed and the 1288 Bell Harry installed on the top. 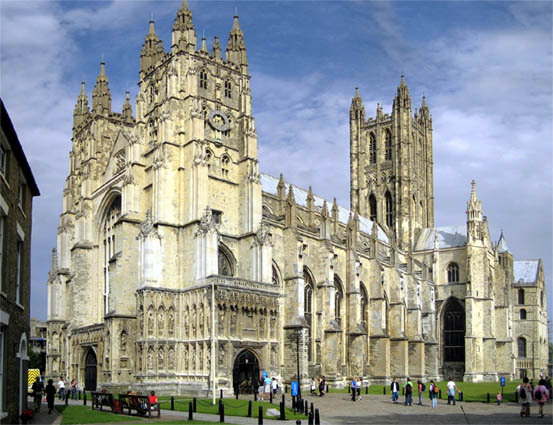 1541 Campanile bells forfeited to Crown. 1557 Sanctus Bell installed, probably in Bell Harry Tower. 1585 Sanctus Bell removed and given to Eastbridge Hospital. Second Arundel bell recast by Robert Mot of Whitechapel. 1606 Third Arundel bell recast. 1624 Fourth Arundel bell recast by Joseph Hatch. 1625 Four of the Oxford Tower bells recast and probably augmented to six. 1635 -6 Arundel bells rehung in a new frame & tuned. The tenor was replaced by 2 smaller bells to produce the first changeringing peal, by Joseph Hatch. 1663 Michael Darbie recasts Great Dunstan. 1684 Christopher Hodson recasts Great Dunstan. 1704 North West tower spire damaged. 1706 North West tower spire removed. 1726 Arundel bells removed and Oxford bells sold to Sandwich. Bell Harry replaced by a second-hand 1635 Joseph Hatch bell. 1727 Samuel Knight casts ring of 8 for Oxford Tower, recasting the 5th. 1728 Samuel Knight recasts the 6th. 1758 Attempt to mend Great Dunstan with solder. 1762 Lester, Pack & Chapman recast Great Dunstan. 1778 Tenor recast by Pack & Chapman. 1802 Peal augmented to 10 by Whitechapel. 1832 North West tower partially removed & rebuilt. 1854 3rd & 6th recast by Charles & George Mears, but found to be the wrong note, so recast again. 1892 Great Dunstan rehung on new steel girder headstock by Mr S.B.Goslin of Bishopsgate. 1897 Peal rehung by Thomas Blackbourne to Mr J.K.Jerram's design. 1923 Peal augmented to 12 by Whitechapel. 1951 Peal rehung on ball bearings and tenor recast by Whitechapel. 1959 Bell Harry has electronically operated hammer. 1975 Bell Harry rehung in new steel frame. 1981 The bells in the Oxford Tower are recast into a new 12 with two semione bell, Great Dunstan together with members of the clock chime are hung in the Arundel Tower and Bell Harry is rehung dead on Bell Harry Tower. 1998 Great Dunstan found to be cracked again, although Whitechapel recommend no action need be taken.